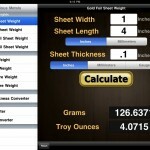 The Precious Metal Calculators app is designed to calculate the wire and foil weight of a given sheet length of gold, platinum, rhodium, and silver. 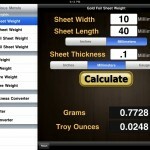 Enter the width, length and thickness of the precious metal in millimeters or inches or gauge. Click on Calculate. 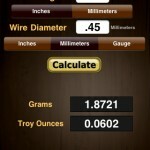 The weight will be calculated in troy ounces and grams. 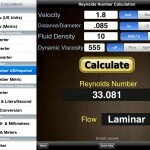 The results can also be emailed through the iphone’s email application using an automatically filled-in email template. 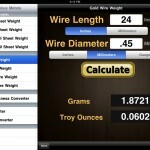 The application is completely compatible with the iPhone OS 3 and iOS 4, as well as the iPod Touch. Please note, all metals calculated are considered pure, unmixed metals. 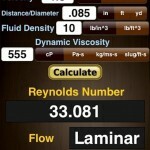 NOTE: This app is for informational purposes only. 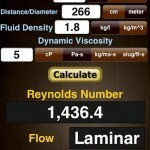 The Plumbing & HVAC Calculators & Converters app is good for reference, educational, and small projects. 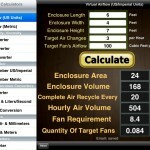 The Virtual Airflow & Reynolds Number calculators are designed to give related and relevant information about the amount of air in a defined area, and the size air handler or fan required to move it in a given amount of time. The air movement can be from a heater, AC unit, chiller, refrigeration unit, closed fan unit or cooler (swamp cooler or evaporative cooler) into the area, or from an exhaust fan moving the air out of the area. 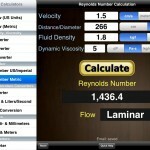 For the distance calculators enter the area dimensions in feet or meters. 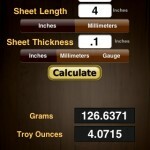 Accuracy to the inch or centimeter is not needed. 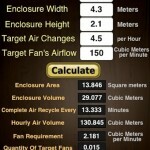 Enter the number of times per hour that you would like total change of the air mass volume in that area. 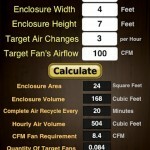 Enter the air flow specification of the air handler (fan) you anticipate using in cubic feet per minute (CFM) or cubic meters per minute. 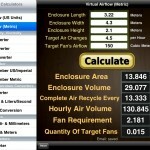 Click on Calculate and the results will be the (air) volume of the area, the amount of time for each volume of air mass change, the total volume of air requiring movement with an hour, the volume air flow of the suggested fan (based on your entries) and the number of fans or air handlers needed if they are of the target size you selected. A guideline for clear air (especially if filtered) in an area is 4 to 8 complete cycles every hour. Note: Should not be considered for open fan blade fans in ceilings higher than 12 feet or with fan’s rated or measured in capacity for a room size in square feet rather than cubic feet.